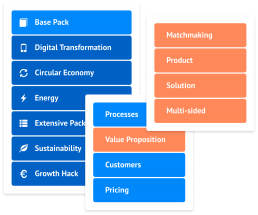 Smart Business Model Canvas and intuitive step-by-step guidance for your venture creation process. The heart of the Smart Business Modeler is its powerful Smart Business Model Canvas, with a large database of business models. However you get much more. We provide you with all the steps in the venture creation process, from idea to implementation, we explain each step and give you templates with examples. Once ready, you can use the Pitch Deck Generator to build your Pitch Deck in no-time. All in one platform – and always free! The Smart Business Modeler platform provides with a Smart Business Model Canvas as well as with the “Swim Lanes” for your venture creation. You get guidance, templates and the latest tools. We streamline the entrepreneurial process: Easy administration, more overview, better feedback. In this 14 minute TEDx talk René Bohnsack, founder of the Smart Business Modeler, shares how business model patterns can change the way of innovation as we know it. Please do share the talk with your friends and colleagues, and help us inspire more people around the world to make their dreams come true.